The nation's unemployment rate dropped by one-tenth of a percentage point to 7.3% in August and non-farm payrolls expanded by 169,000 jobs over the month, according to a report today from the Bureau of Labor Statistics (BLS). Today’s disappointing jobs report shows that labor market conditions continue to improve only at a glacial pace compared with what’s needed to restore employment to normal levels. Unemployment remains too high and the share of the population with a job remains depressed at levels last seen in the 1980s (see chart). Under these conditions, it’s disappointing that the Federal Reserve will likely begin tapering off its asset purchases (known as “quantitative easing”); it’s absolutely appalling that lawmakers have not enacted a balanced alternative to the sequestration budget cuts that would take effect only when the economy is stronger. The jobs report released today underscores the fact that we still need all macroeconomic guns blazing to boost the economy. The labor market added 169,000 jobs in August, and a downward revision of 74,000 to earlier months’ data brought the average monthly growth rate of the last three months to just 148,000 jobs. At this rate, it would take until well into 2021 to fill our gap of 8.3 million jobs and return to a healthy labor market. Job growth continued to be narrowly concentrated with retail adding 44,000 jobs, health care 32,700 and restaurants 21,200. The jump in health care employment follows three months in which growth averaged just 13,600, so growth is not likely to continue at this pace. Manufacturing added 14,000 jobs driven by a rise of 18,800 jobs in autos. This increase is mostly a seasonal-adjustment issue since the auto sector reported a loss of 10,400 last month. However, jobs in the sector are up by 24,300 over the last year. As I discussed on Thursday, the Pennsylvania experience fits the pattern Baker describes of a weak labor market forcing people to take bad jobs. Below I present a version of Baker’s graph for Pennsylvania counties. With one caveat, it is also the case that the higher unemployment is in a county, the larger the increase in the share of employment accounted for by hotels and restaurants. 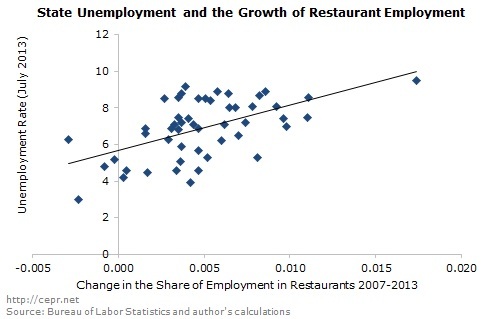 The caveat applies to a group of mostly sparsely populated and rural counties on the right of the graph: Carbon, Forest, Susquehanna, Bedford, Somerset, Tioga, Blair, Potter, and Cameron counties all experienced relatively large reductions in employment in hotels and restaurants between December 2010 and December 2012. Outside of those exceptions, the weaker the labor market in a Pennsylvania county, the greater the likelihood that workers are being forced to take the only jobs available, which are increasingly in hotels and restaurants.